The results from Week 1 of the new college football season are in the books and when it came to the SEC last week this power conference lived-up to its reputation. Only one team lost (Vanderbilt) straight-up and the SEC as a whole paid-off for bettors with an 8-4-1 record against the spread. The biggest game on the Week 1 schedule in this conference was Alabama against Wisconsin in a neutral-site showdown. The Crimson Tide passed that early test with flying colors in a 35-17 victory while easily covering as 12.5-point favorites on 5Dimes’ closing betting odds. The total went OVER the closing 44.5-point line. This Saturday, Alabama will play host to Middle Tennessee in their home opener as a heavy 34-point favorite. Auburn got past Louisville in Week 1 with a 31-24 victory, but it could not cover as a 10-point favorite. The total went OVER the 54-point closing line. The main concern for the Tigers heading into this Saturday’s game against Jacksonville State is the inconsistent play of quarterback Jeremy Johnson in that win. He only threw for 137 yards and a score while completing just 11 of his 21 attempts, but the worst of it was his three interceptions. The South Carolina Gamecocks got this winning roll for the SEC going last Thursday night with a 17-13 victory over the ACC’s North Carolina Tar Heels. They covered as slight 1.5-point home favorites and the total stayed UNDER the 62-point line. South Carolina will open conference play this Saturday against Kentucky and 5Dimes has opened the Gamecocks as 9.5-point home favorites. LSU is one of five Top 25 teams in the SEC’s West Division and it will open its quest for a birth in the SEC title game at the end of the season as a three-point road favorite against Mississippi State in this week’s matchup. The Tigers’ season opener against McNeese State had to be cancelled due to lightning. The Bulldogs come into this conference opener fresh off a 34-16 victory on the road against Southern Miss, but they failed to cover as 20-point road favorites. I went with Tennessee last week as my top SEC pick and the Volunteers came through in a 59-30 rout over Bowling Green as 20-point favorites. 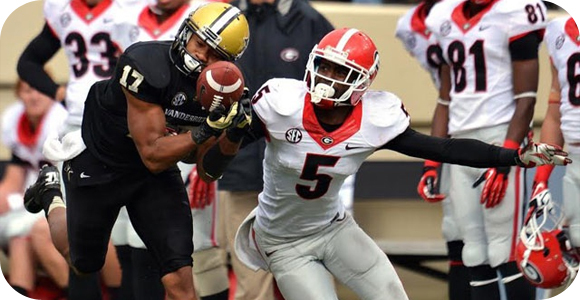 This week I am going with a SEC conference matchup in the East Division between the Georgia Bulldogs and the Vanderbilt Commodores as my top play. I was highly impressed in the Bulldogs debut last week against UL Monroe. They cruised to a 51-14 victory while covering a 34.5-point spread at home. Heisman hopeful Nick Chubb got off to a strong start with 120 yards rushing and two scores on 16 carries. Georgia’s offense rushed for a total of 243 yards for an average of 6.4 yards an attempt. Even more impressive was the Bulldogs’ defense holding the Warhawks to just 251 yards of total offense. Vanderbilt’s 14-12 loss to Western Kentucky last Saturday as a two-point home underdog was the lone blemish on the SEC’s Week 1 record and the Commodores are now 1-5 SU in their last six games and 3-5-1 ATS in their last nine home games. A failed two-point conversion on a late score proved to be the difference in Saturday’s loss. Georgia has owned this series on the road in the past with a 9-1 SU record in its last 10 trips to Vanderbilt. The Commodores do have a positive 4-2 record ATS in their last six home games against the Bulldogs, but as 19.5-point home underdogs this Saturday, I just do not see them keeping things any closer than three touchdowns.